A 100% natural herbal relaxing oil. This product is prescribed in the Ayurveda texts to alleviate stress, exhaustion and tension from overwork. Rejuvenating Body Treatment is a blend of naturally grown herbal ingredients processed in whey and sesame oil. Jelly leaf helps remove fatigue and alleviate muscle ache and pain, while winter cherry helps ease stress, build muscle and tone skin. Explore the entire range of Massage / Carrier Oils available on Nykaa. Shop more Kama Ayurveda products here. 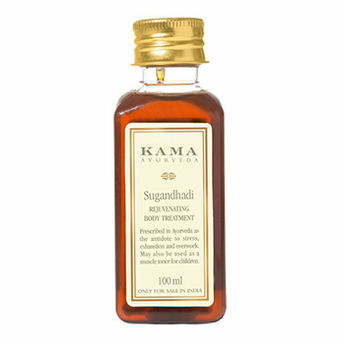 Alternatively, you can also find many more products from the Kama Ayurveda Sugandhadi Rejuvenating Body Treatment Oil range. Explore the entire range of Massage Oils available on Nykaa. Shop more Kama Ayurveda products here.You can browse through the complete world of Kama Ayurveda Massage Oils .Alternatively, you can also find many more products from the Kama Ayurveda Sugandhadi Rejuvenating Body Treatment Oil range.